It’s one thing to build a scale model of a car. It’s another to power it with a working quarter-scale V-8 engine. That is exactly what the engineer Gary Conley did at the recent International Manufacturing Technology Show (IMTS) in Chicago. He showed off the supercharged Stinger 609, which is said to be the smallest four-cycle production V-8 in the world. The engine might never have made it to the IMTS without the outside manufacturing expertise of engineers from Sunnen Products Co., who worked with Conley to make the engine’s cylinder liners. Using a Sunnen hone to produce the cross-hatchings inside the liners, along with a separate process to “plateau hone” them, Conley was able to provide adequate lubrication for the engine at speeds of more than 10,000rpm. 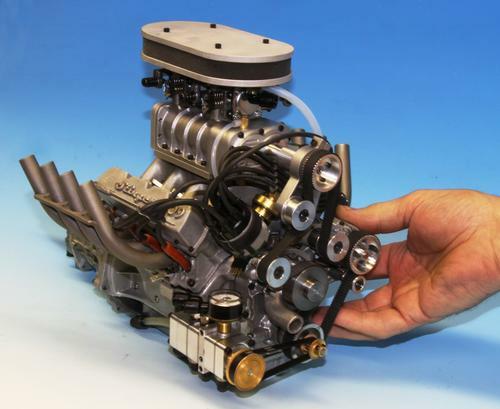 Conley’s tiny, supercharged V-8 produces 9.5HP at 10,000rpm. Conley worked with Sunnen to develop a two-step solution to the problem. First, the engineering team used a coarse stone on the honing machine to create cross-hatched “valleys” that allowed the inside walls of the liners to retain oil. Then, they used a finer stone to shave off the “peaks” of the cross-hatchings, enabling the piston rings to seat more efficiently. Conley’s Stinger 609 engine, which packed the aisles at the IMTS, is named for its 6.09-cubic-inch displacement. With a one-inch bore and a 0.952-inch stroke, the engine puts out 9.5HP and 13 pounds of supercharged boost at 10,000rpm. It is designed to provide power for scale-model cars. Production runs of the Stinger 609 are small. Conley’s company, Conley Precision Engines Inc., built 40 on the first run and is producing 70 on the second. Eventually, he hopes to scale up his runs to between 150 and 180 of the units, which cost between $5,600 and $7,500 each.